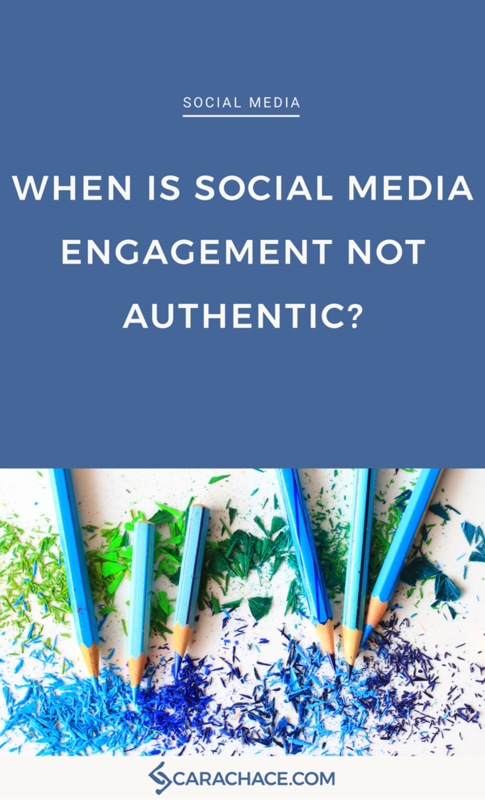 I had a not-so-cool experience with an Instagram user a few weeks ago - which led to the question - when is engagement not authentic? Leave me a comment below and let me know if this has happened to you and how you felt about it. Hey hey, this is Cara Chace, social media strategist - and I'm coming at you with my first vlog. I have been blogging for awhile now, and I thought I would switch up my content and be a little more conversational. I specifically wanted to talk about something that I encountered on social media a couple weeks ago, and I wanted to know what you thought about it. Since I started my business I have been focusing the most on Instagram. The reason being I was the most behind as far as numbers. I kept my account private for a really long time because I had a lot of pictures of my daughter and I wasn't running a business. The last several weeks, 6 weeks or so, I have been focusing on Instagram - and in doing so I'm following a bunch of people that are well-known for being really great at Instagram - Instagram experts and people that teach it, in order to learn some things that maybe I don't know. Several weeks ago - I think it was about 3 weeks ago - I was laying in bed scrolling through my feed as a lot of people do, and I came across one of these people's posts. They offered some social media tip and then asked, 'Comment if you agree, tag your friends if you want to share.' or something to that effect. I was one of the first people to comment, and I commented something to the effect of, 'Great tip, I love it.' with a thumbs up and a smiley face. This person responded to me by tagging my name so I would see it obviously, and simply said, 'please TAG.' with the 'TAG' in all capitals. My first reaction was, 'Excuse me?! You're welcome for the engagement. I didn't want to tag my friends, and I think I'm going to unfollow you now.' It got me to thinking that sometimes as a small business owner we get so caught-up in trying to figure out what's going to work in getting that 'engagement' that we forget to be authentic and we forget what it's like to be a fan and follower and how we want to be engaged with as a fan or a follower. I know as I've been building my business I focus a lot of energy on my analytics and testing to see what works; different types of posts, different times of the day, different platforms, different everything - just to see what hits that sweet spot on social media. But one of the worst things you can do for a fan or a follower is to alienate them, and quite frankly I felt admonished by this person. That's not a way to build a relationship because social media is not about sales, it's about social - and it's about building those relationships. I think one of the other things that business owners, or social media account holders, might tend to forget is that time is now the greatest commodity. Even more so now that we're in this era of snackable content, short clips, and shorter attention spans. When someone not only looks at your content, but bothers to read your content, and then goes even further by engaging on that content - you need to respect the fact that they're going to engage in whatever way feels comfortable for them - and you should be thankful for it. Even if they just put a smiley face - thank them - let them know that you saw that and you appreciate it. What's going to happen is when you take the time to do that you build trust and you build the person behind your brand - that trust - and THAT'S what leads to sales. Just be real and be thankful. I would love to hear what you have to say about it. I'd love to hear if you have a different perspective or something to add, or if that's ever happened to you and how you feel about it. Please let me know in the comments below. Thank you so much for watching and I look forward to hearing from you. Have a great day.